Looking for a way to occupy your kids that doesn’t involve them becoming almost comatose in front of a television screen? Look no further. Electric scooters are not only innovative ways of ensuring your kids get out of the house. They offer hours of entertainment regardless of the setting, so they’re the go to solutions no matter where you live. Whether it’s a ride around the neighborhood or a journey down the beach promenade, electric scooters are versatile, portable activity gadgets. Selecting the right electric scooter for your child can be a confusing task. Factors like weight class, age brackets and price range need to be taken into consideration if you want the right fit. Make use of this buyers guide while navigating the market. Below you’ll find a comprehensive breakdown of our top five picks of electric scooters for kids. Complete with pros and cons, the reviews will give you a better idea of what to expect from your investment and how to pick the best for your child. The upgrade of the traditional scooter, electric scooters are two or three wheeled motorized devices. They’re designed to support the weight of a single individual (either child or adult depending on the specifications). The rider stands on the scooter and the motor propels it forward at a controllable speed. Electric scooters are intended for outdoor use and would not function well in confined spaces. Traditional scooters required the rider to push the scooter body forward using one of their legs. Electric scooters eliminate the need for any effort from the rider. Simply board, stand and go. Due to the overwhelming popularity of these devices the market saw an opening for electric scooters for both adults and children. Naturally, the adult scooters are bigger & more powerful. Since they hold more weight they have stronger motors and can reach speeds that children’s scooters can’t. That’s a great safety feature, as you don’t want kids’ toys to be difficult to control. The design also allows for greater battery life and longer running times when compared to the more limited children’s units. While children’s scooters are easier to maneuver, adult scooters require the rider to maintain all the balance while on board. They tip over a lot easier if weight is not properly distributed. Due to their more advanced nature, adult scooters are usually more costly than the ones intended for children. The mechanics, framework and performance standards come at a heftier price tag than the simpler kids’ models. There are many factors that go into putting together a reliable electric children’s scooter. They’re dependent on the manufacturer in question and some of these factors will vary from model to model. It’s imperative you take each of these specifications into consideration when selecting an electric scooter for your child. Weight limit capacities will be considerably different when comparing one scooter to the next. The materials used to make the frame of the scooter will enable different weight capacities. Plastic scooters, for example, will be able to handle less weight than an aluminum scooter. For optimum performance it's important that your electric scooter isn’t outweighed by your child. It’s simple: Lighter scooters for lighter children, heavier scooters for heavier and older children. Closely related to this matter, we recommend you think ahead: Invest in a device that allows for your child's growth…literally. Purchase a scooter for your child where they fall far below the maximum weight capacity. This allows them to grow and still make use of it for a longer period of time, compared to buying a model that’s JUST right for them in terms of weight class. We recommend making your selection based solely off weight capacity and not given age brackets. Ages are subjective and have little to do with the physical stature & ability of the child in question. Comfort is always key if you want your child to enjoy his or her toy, but don’t put this at the top of your priority list. Since most scooters require the rider to stand, bodily comfort is not of concern—your child will need to exert him or herself to enjoy the scooter. Luckily, the market is diverse. For children who may be more comfortable sitting (or who have impairments) there are seated electric scooters available. Most people are more comfortable standing when riding a scooter. Adequate foot rest space is key in these instances. In the event of your child’s feet hanging off the sides, riding comfort could be compromised. Therefore - read details on dimensions thoroughly and compare to your child’s shoe size. When it comes to scooter comfort the handlebars of the device are probably the most important. For safety and security your child needs to be able to grip them for long periods of time. Padding and size determine whether this will be comfortable. Unfortunately the nature of electric scooters leaves the running rate quite different from the charging time. With children’s scooters, reaching a full charge can take between 12 and 24 hours depending on the output of the charging point. At full charge, most electric scooters for children can run for around half an hour, or 10 miles. Some more, some less. In higher-end units it’s not uncommon to find children’s scooters that can run for over an hour at full charge. Although you’ll pay extra for this capability, it does ensure longer periods of enjoyment per session. Similar to the traditional bicycle, electric scooters feature a simple hand brake mechanism. This is located directly under either the left or right handlebar for easy access. The brake connects directly with the wheel mechanism and brings the device to a stop when your child applies pressure. Although this braking mechanism is simple, it’s more than sufficient for the speed at which these scooters can go. At full speed it will bring the unit to a gradual and safe halt. In addition to the hand brake, most children’s scooters will feature some sort of foot-based pedal brake as well. This is a backup braking feature for the event of sudden, harsh braking being required. The foot brake tends to work instantly compared to the hand brake and therefore it’s usually used in emergency situations. The storage required for a child’s scooter will vary depending on the make and model. The thinner, metal scooters wherein the rider must stand can usually be folded in half and stored this way. This is great for travel purposes as the device can slot into significantly smaller spaces such as the boot of a car with other luggage. Bulkier, plastic made scooters made for sitting are a bit harder to store. They don’t collapse or become smaller in any way and need to be stored as is. These scooters usually require valuable closet space unless you have an area in your garage to place it. Three wheeled scooters also tend to be significantly wider than those with two wheels. Keep your storage capabilities in mind when selecting the right scooter for your child. If you know space is an issue, avoid the non-folding scooters. Clothing: Physical safety is vastly important. You may want to consider providing your child with a set of elbow and knee pads to wear while riding. In addition to this, a helmet is also a worthwhile investment. Hopefully these are never put to use. However in the event of a fall they will help keep your child from serious injury. Rules: Road safety needs to be emphasized when a child is using a scooter. Ensure that the rules of the road are well known and obeyed at all times. Let there be repercussions for when your child chooses to ignore these rules. Stay alert: When outside and on public roads there are endless threats to the safety of your child while on an electric scooter. Making him or her aware of their surroundings and the presence of other drivers is a sure step to keeping them alert while on a ride. Electricity: One more safety point to keep in mind is that these are electric scooters and not manual. This adds the threat of electricity into the mix. Make it clear to your children that under no circumstances should they attempt to mess with the electronic parts of the scooter. They shouldn’t poke or prod the mechanics for any reason, especially not with other metal objects. This is basic electrical safety but it’s always relevant. Make sure they understand that in order to have the maximum amount of fun, they need to always be safe and follow the rules you have laid out for them. No exceptions. We love this zippy little device from Razor. Razor is an industry leader when it comes to the electric scooter market. The brand’s products offer consistent quality and performance throughout the range. This particular unit is best suited for riders 8 years and up. 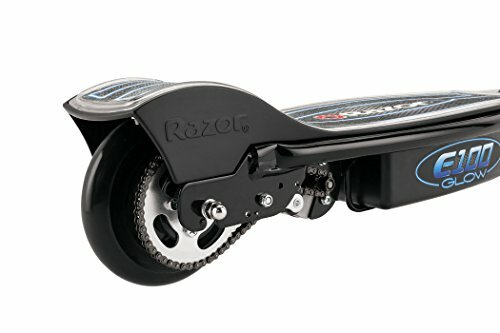 The handle is twist grip and controls the speed & movement of the scooter. The handles are soft enough to grip over long periods of time without much discomfort. We love the inclusion of blue LED lights in the floorboard that light up each time the throttle is turned. There is only one brake on this scooter and it’s operated by hand. The brake connects directly to the rear wheel. 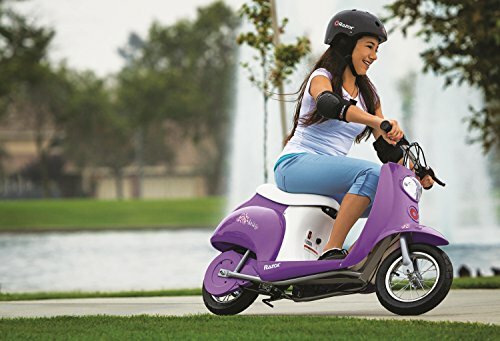 Depending on conditions, the scooter will run continuously for up to 40 minutes. This is off a full charge that takes 12 hours to complete. Razor recommends leaving the device on the charger longer if possible, to extend battery strength. Up to 24 hours is suitable. This scooter reaches a maximum speed of 10 mph. It weighs 32 lbs. and comes with a limited 90 day warranty. Razor is a great brand to invest in because they offer both riding and protection solutions. Also in the Razor brand are a range of helmets and safety pads to ensure your child is fully covered. 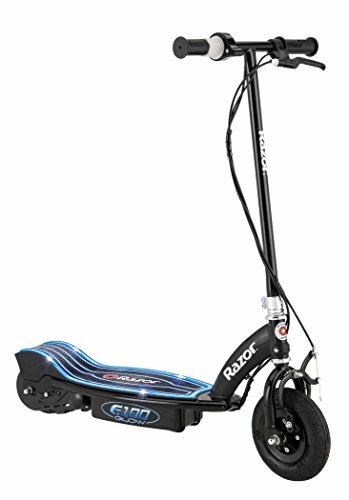 This scooter by Razor is kind of like the big brother to the afore mentioned model. This device has the ability to reach speeds of up to 15 mph, as opposed to the standard 10 on most models. It’s probably because of this that the scooter is only suitable for children 12 and older. The run time is standard on all Razor models: 40 minutes of continuous use on a full charge with a charging time of 12 hours. The tires are significantly wider on this scooter in comparison to others. These combined with a quieter motor make for a notably smooth ride around town. It then becomes irrelevant that this is a bulkier scooter compared to others, as the performance is well optimized. 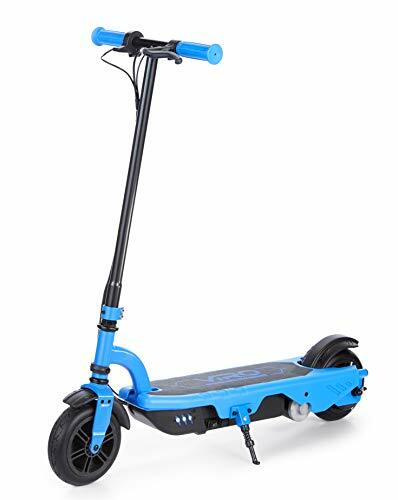 We love the electric blue tone of this scooter. It makes spotting your child over long distances or in big crowds much easier. The scooter comes with the standard limited Razor warranty of 90 days. Our top pick for a great seated electric scooter. This unit by Razor is their solution to a more classic take on the conventional scooter industry. It’s designed like a vintage motorbike upon which the rider perches with both feet up on the board. In order to balance it features 12” tires and rear suspension. It’s targeted at children aged 13 and up; so long as the child is under 140 lbs he or she can ride. Similar to the other Razor products, the scooter will run for 40 minutes at full charge. Recharging the batteries will take between 12 and 15 hours. 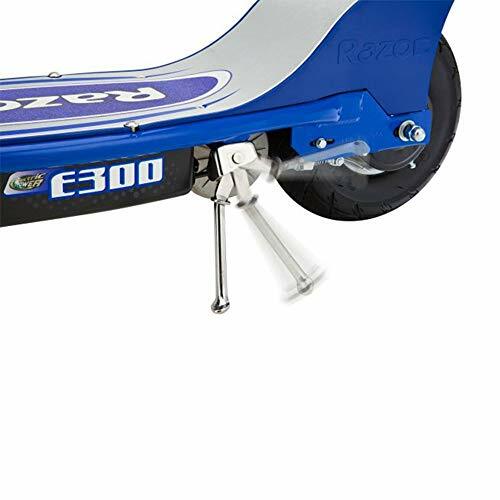 Unlike other Razor products, however, this scooter actually features on-board storage. Under the seat there is space for all the belongings a child may need to take with them on a ride. These Pocket Mods come in a range of exciting colors. From shocking pink, to retro red to cool blue - there is something for everyone. The electric motor is high performing and provides a smooth, safe ride every time. Because these are naturally bulky units, the only difficulty will be finding somewhere to store them. A corner in a garage or empty closet would be most ideal. 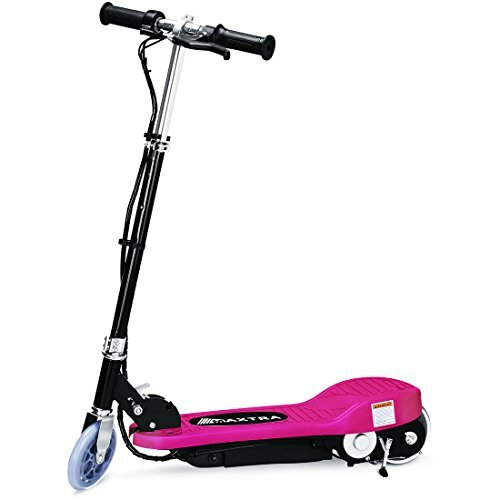 The 90 day limited warranty is available with this scooter as well. 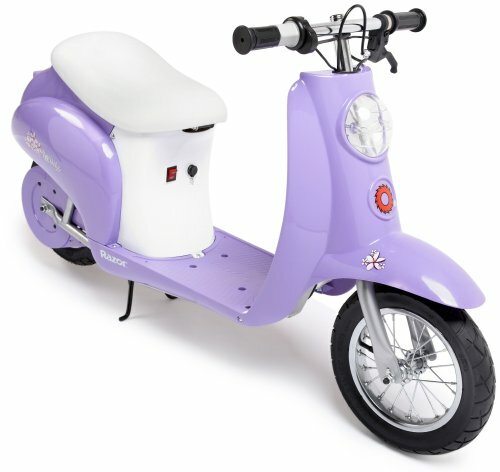 This scooter by VIRO is a great budget pick for children 8 years and up. The batteries on this scooter charge fully in 12 hours and then the device will run for a solid 40 minutes. This usually allows the rider to go about six miles before the device will turn manual. 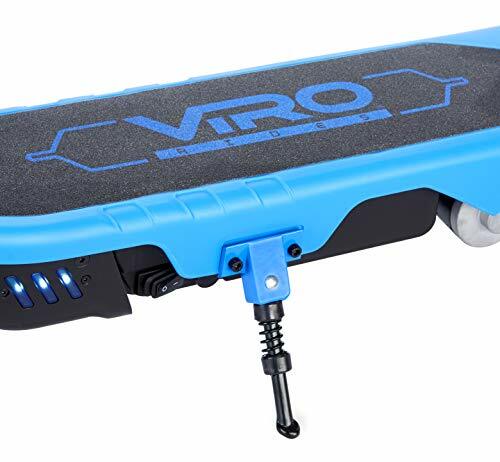 The VIRO is best suited to those weighing less than 120 lbs. Weights above this will cause performance to be slightly compromised. We appreciate the inclusion of two brakes on board this scooter. One is hand operated and one is operated by the rear foot. This valuable safety feature is often neglected even on devices with heavier price tags. Impressive! The built in LED lights make the scooter visually noticeable in low light. This makes it safer to use during sunset or sunrise rides. This scooter by VIRO is particularly compact and easy to store & port around. Take it on outings or even on vacation with ease. There is a handy kickstand built into the floor board. It will keep your scooter upright when not in use. All in all, this unit by VIRO is a great, affordable option to anyone looking to get their child into the world of electric scooting. The scooter is suitable for 8 year olds and up, and your child will learn & grow with the device without outgrowing it too quickly. 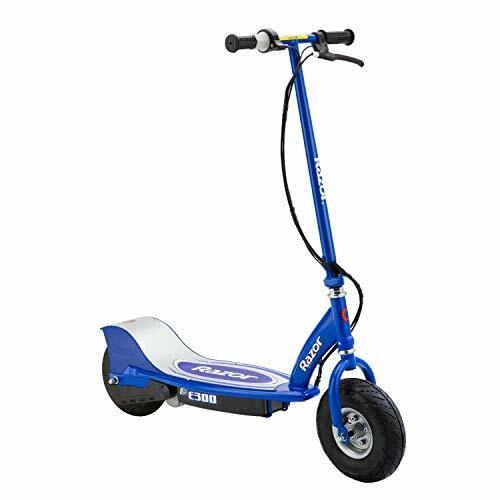 This is a sleek and stylish little scooter by trusted brand Maxtra. As the name suggests, this scooter is suitable for children under 160 lbs. Any child from as young as six years old can make use of this device safely. The framework is exceptionally lightweight and the body of the scooter folds in two when needing to be carried or stored. This makes it very easy to transport and store. The tires are perhaps the most impressive parts of this scooter. They are skid and puncture proof & deliver a seamless riding experience free of wear & tear. 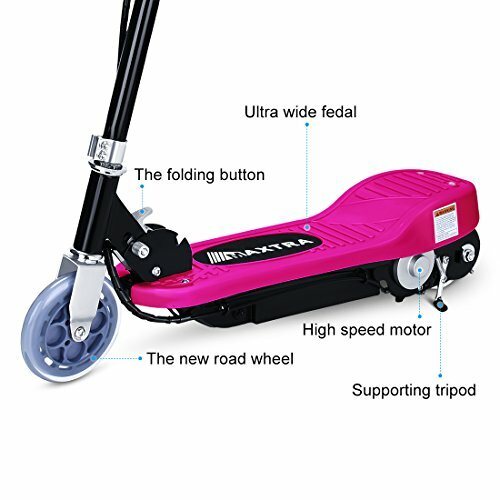 Somewhat, more impressively, this Mantra scooter can run continuously for 60 minutes at full charge. When it comes to children’s scooters the industry norm lies between 30 to 40 minutes. A full hour is virtually unheard of. Also well above industry average, the scooter manages speed of up to 12 mph. The motivation behind Maxtra to produce these electric devices are fueled by skill building. Maxtra enjoys the idea of an electric scooter being a means of building left and right brain coordination. They also believe these devices to be the starting point of getting children outside and active. This electric scooter comes with a one year warranty. When the scooter’s batteries are dead then yes, most children’s scooters can seamlessly shift into manual devices. Instead of using the mechanics for power, the child will be able to propel the scooter by using their legs only. This is a great feature because it means that enjoyment of the device doesn’t have to come to an end just because the battery life does. Your child can continue to enjoy his or her time out and about on their scooter until the next charging opportunity. Most electric scooters have switches built in that need to be lifted in order to let the devices know that they will now be used in manual mode. Can they regenerate battery while braking? This is not a standard feature for most children’s scooters. However, it’s possible to find units that are equipped with this ability. Battery reiteration while braking is something seen more commonly in adult scooters. The unit has the ability to recharge battery each time the scooter brakes. Since this technology is more advanced it’s easy to see why it wouldn't come standard in devices for children. Most children’s scooters simply charge, run and need to then be recharged. Higher-end electric scooters for children might have this handy ability built in. The running time would increase significantly if this were the case. Each time the child brakes, the battery would gain back a portion of its charge. Making the decision to invest in an electric scooter for your child is about more than just some fun in the afternoon. There’s much more to be gained by mastering the art of scooter riding than meets the eye. 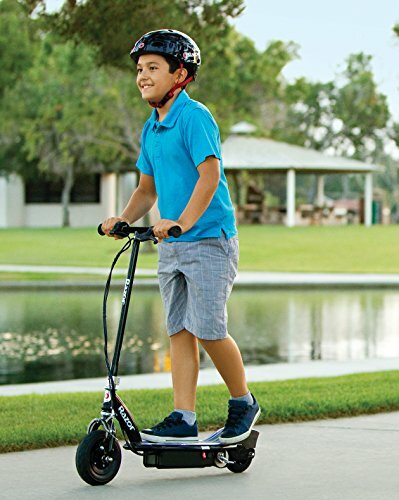 Electric scooters add an entry level experience into the world of hand eye coordination, motor skills and balance. Technically, you’re also doing your bit for the environment. Electric scooters are zero-emission devices and run solely off battery power. Since almost all electric scooters double up as manual scooters, it’s a two-for-one deal. You child will have the best of both worlds on their riding journey. Electrical scooter riding is fun for the whole family. Treat your child today!